I’m fundamentally opposed to drafting a QB in the first 3 rounds this year. 1) Alex smith can’t be comfortably cut this year or next year. If there is even a chance he comes back and can play in 2020, do we really want to invest a high pick on a QB in 2019? 2) this appears to be a relatively weak QB class at the top. 3) and this is the big one - drafting a QB high doesn’t make sense given the situation with Gruden. Unless he suddenly turns things around, this is very likely his last year here. A rookie QB is almost certainly not going play well enough to help Gruden keep his job another year. And do we really want to draft a QB this year and have the new HC we get next be saddled with the guy Gruden and Bruce pick in 2019? But keep in mind you can't just assume the stars will align next year, or the year after, for us to be in position to select one then. As we sit here now, Tua and Justin Herbert will come out, plus a couple others, and figure to go high. But what if we go 8-8 in 2019 and we're picking 16th in 2020? Or what if Tua has a bad year and we question whether he's worth a 1st rounder? What if Justin Herbert gets hurt like McKenzie Milton level hurt? Can't count on it. If a QB you think has franchise chops is there at 15, this franchise must take him. They're hard to come by and you can't count on it. If you don't think Haskins, Lock, Murray or Jones are worth a 1st rounder then that's one thing. But the reason to pass on a QB can't be 'because next year will be a better opportunity'. We can't know that. We had Kirk, we had Alex, but our reality is we're back to having nobody. We need to get one. Again, I'm not advocating for a reach, but we've got to take the bat off our shoulders. Sometimes you have to take big chances, at 15 I hope to draft a QB unless we sign a veteran (Foles) for a few years. I was watching some Lock highlights to get myself fired up. Dude has a cannon arm. I'd be OK with Lock or Haskins at 15. Need to review Jones some more. My preference is Finley in the 3rd (or one of the other guys ranked somewhat highly if they slip) and BPA in 1st 2 rounds. Lock is has a cannon but again so does Josh Allen, their accuracy has always been the knock. To me Grier is the best option for 15. I guess its a crapshoot tho like normal. Haskins should be the first qb taken. He had a ridiculous year against good competition. If he is there when we pick we simply have to take him. Whoever made the Apke pick shouldn't get a vote. Also Jay Gruden should be removed from most if not all personnel decisions. He is most likely gone after this year. But why would we draft a QB in a bad QB class when Gruden will be fired next year and/or Smith will be back? Drafting a QB seems very short sighted. It’s the “let’s not plan long term but try to get the fans excited” kind of move. 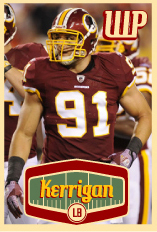 So make the most perfect Redskins decision ever. You just assured us we draft a QB. It's a QB league but this franchise has been avoiding drafting that position for almost 7 yeats. Always BPA in Round 1, at least. Apke was picked too high but I hope he surprises next season. We fans deserve it after the Doctson fiasco.